Learning English online is possible, but you need a good plan to stay on track. When I started teaching ESL a little over 10 yrs ago, there were few materials online that my students could use to practice on their own. Now a lot of help is available at different levels and for different needs, so that you can choose what is most helpful to you as your English improves. Is your goal to study or work in an English-speaking country? Do you need to pass an important admissions exam or professional test? Do you need good English for business or professional communication (or just to keep in touch)? In each case you need a specific plan for your English studies, to get from what you already know to what you want to be able to do in English. So how can you start? You already understand quite a bit of English if you have read this far (unless you used translation!) So start by evaluating what you already know, what you want and need to learn, and how you learn best. Some people learn best by seeing, using actual or mental pictures. Others need to hear and can benefit from podcasts, songs, and repeating words or phrases aloud. Physical action (even just writing words down) helps others. Try different techniques to find your own learning style-- then use what works for you! Individualize your plan based on your needs and interests as well as your learning style and the time you have available. One advantage of studying online is that there are so many approaches to choose from. No one website, however good, will be best for everyone, and no one site will have all YOU need. Check out the many resources available! >Exactly what do you still need to study? Academic vocabulary? English sentence structure? Reading comprehension? Decide what’s most important to focus on. >You can learn English-- but only if you think you can! Do consider the limits on your time and capabilities when you plan. Choose a goal you know is possible in the next few months. When you reach it, you’ll be more motivated to keep going than if you aim too high at first. >Are you willing to put in the time and effort needed to reach the goal you set? If not, choose a goal you can actually keep working toward, week after week. It helps to set easier short-term goals along the way. For example: I want to study Animal Farm by George Orwell so that in 2 weeks I can write a paper about it. (or) I want to practice making business calls in English with my friends, so that when I get promoted next month I will be confident I can do it. 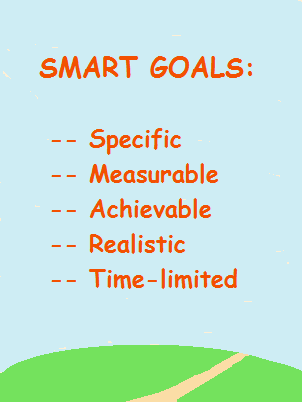 Also, is your goal relevant-- related to what you really want from life? If you set a goal because someone else thinks you should or it sounds good but is not really in line with your hopes, it will be hard to keep working for it. >Set definite time limits. (See the short-term goals above.) How often do you plan to practice? For how long? When do you plan to reach your goal? Study English Online can help you make a personalized action plan and organize your study time. Find the best order to study and practice the English you need based on your level and goals. There is no substitute for talking to people in English when you can. Talking face to face, you can see a person’s expressions and gestures and the way they combine with the rhythms of English. It’s easier to notice their word stress and the feelings behind the words. Seeing and hearing in person (or watching good quality video) is important in learning any language, and almost essential for understanding humor or attitudes. What can you do if you are not in an English class and don’t have any English-speaking friends? See English Conversation Practice for some ideas of how to find practice partners and other opportunities to practice English in non-stressful situations. Practice is vital, whether in person or online. The more listening and reading you can do (at an understandable level), the better you will learn the words and patterns of English. Studying grammar and vocabulary can help make those words and patterns clearer, but only repeated exposure-- listening and reading A LOT—will make it yours.